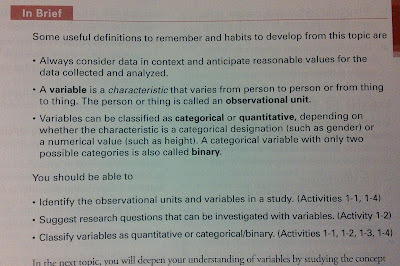 I have the pleasure of teaching an undergraduate basic statistics class this fall for the third consecutive year. It's not a class I had any specific preparation to teach, but I've tried to make up for that by becoming familiar with some of the statistics education literature, bolstering my content knowledge (although I doubt it will ever be as wide or deep as I'd like), getting access to good resources, and being mindful of the needs of my students. And that's it. As someone who works almost daily with the Common Core State Standards, building a course around such a sparse description would be quite a challenge, especially for a first-time instructor. 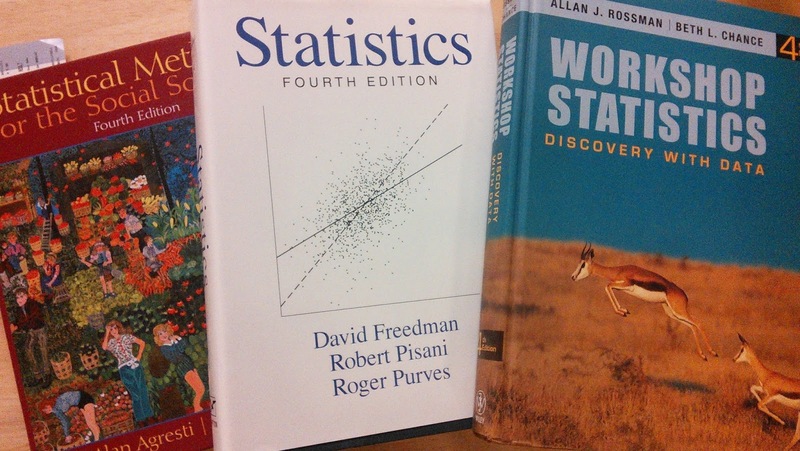 When I talked to Derek Briggs about teaching the course, he advised that I use his preferred text, Statistics by Freedman, Pisani, and Purves. I'd recently used Agresti and Finlay's Statistical Methods for the Social Sciences for my qualitative methods courses, and while that book suited me pretty well, I was open to something different so I ordered the Freedman text for my class. In hindsight, the Freedman text was fine, and the Agresti text would have been fine, too. Both were decently well-written and had plenty of problems to assign, but that's the thing — I was looking for a text that offered considerably more than explanations followed by problem sets. I really wanted something that supported students working together in groups during class, making sense of the material as we went along. 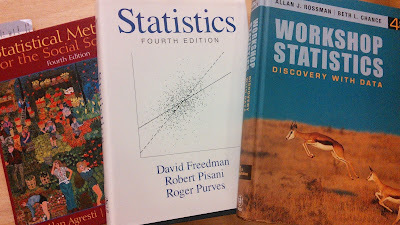 One book that had gotten my attention was Workshop Statistics: Discovery with Data by Rossman and Chance. 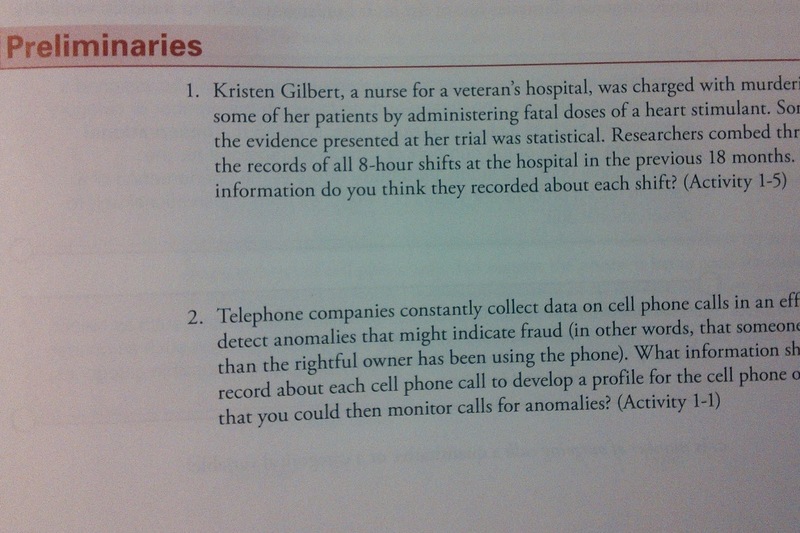 I recognized Beth Chance's name immediately from some of the stats education literature I'd read, and felt good that this text would offer what I was looking for. I used the text last year and was not disappointed, and will be using it again this year. Below is a summary of some of the reasons I like Workshop Statistics. In the front matter of the book, Workshop Statistics contains a list of activities by application — in other words, they've categorized all the problems by context and indexed exactly where those contexts get used. The list of related problems appears again with each problem in the text (inset in picture above), so it's easy for me or my students to refer back or forward to where that context appears. I believe in teaching mathematics rooted in context when possible, so I found this an especially helpful way of finding problems that might be relevant or interesting to the students in my class. 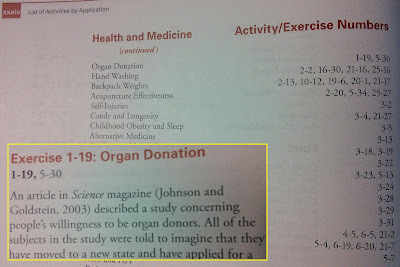 Every topic (lesson) in the text opens with some preliminary questions. Some involve data collection, which is great, but at the very least it gives students an opportunity to consider a question and how we might answer it. If Dan Meyer has made anything clear, it's that we shouldn't teach math as finding answers to questions that nobody has bothered to ask. The in-class activities use some interesting contexts and support groups working together. If anything they can be a bit over-scaffolded, but that relieves me from having to lecture much and I can spend most of my time going group-to-group in the classroom and dealing with questions more intimately. There are a number of smaller things that I'm fine with, although they aren't deal-makers or deal-breakers. 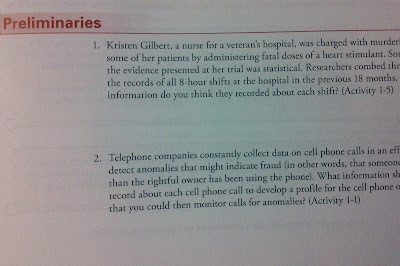 The pacing of the text is good — if we cover about two topics a week, we finish the text and pretty much everything one would expect in a basic statistics course. The order of the topics is sensible, too. 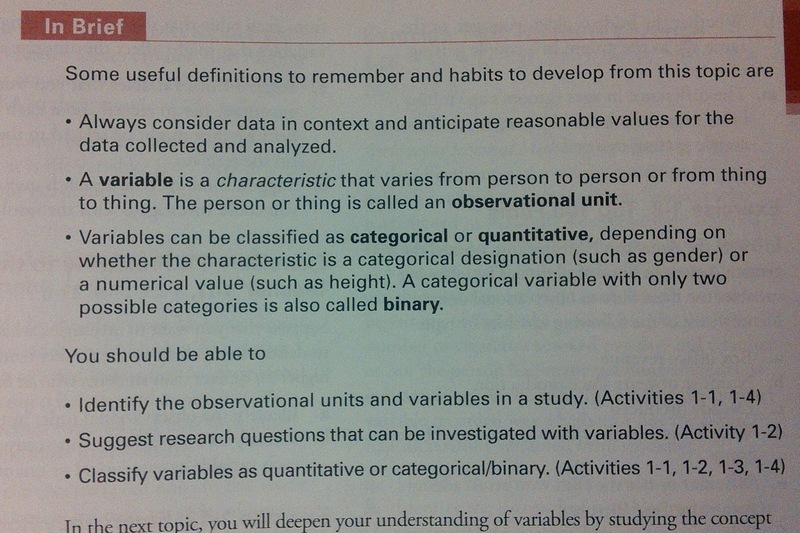 Typically, it makes sense to put descriptive statistics before inferential statistics, and to work from one-variable stats to two-variable stats. 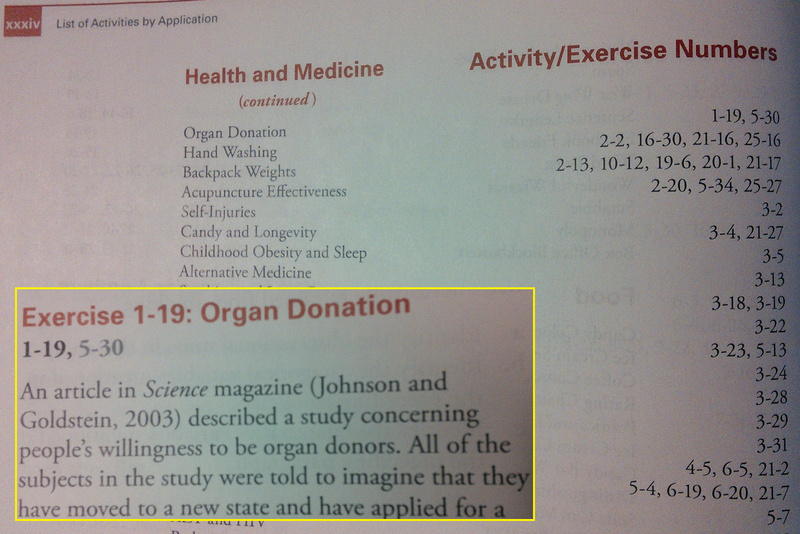 This book is no different. Some texts put linear regression earlier, and where probability should land in a book seems to be negotiable. The placement of those topics in this book is fine for this course and the progression from topic to topic was very manageable. Other than my first day activity, I haven't written much about teaching stats, but look for me to change that this semester.